Helen R. Fenlason, 97, of Westborough, passed away peacefully on Thursday, July 12, 2018 at the Beaumont Skilled Nursing and Rehabilitation Center in Worcester. She was the wife of the late Beryl M. Fenlason. Born in Princeton, Maine, she was the daughter of the late Helon and Edna (Metcalf) Perkins. She was raised and educated in Maine. Helen was employed by Chase Paper prior to her retirement and was a member of the First United Methodist Church. 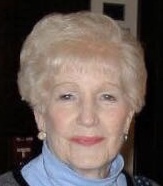 She is survived by two children, Maureen M. Kopper and her husband, David, of Shrewsbury and Peter R. Fenlason and his wife, Ann, of Barre; one sister, Harriette Mowry of Shrewsbury; two grandchildren, Lindsay Fenlason and Kate Fenlason; four great-grandchildren, Autumn Dawn, Riley McGee, Lauryn Burke and Dylan Burke and several nieces and nephews. She was predeceased by her siblings, Milton Perkins, Freedom Perkins, Voigt Perkins and John Perkins. Her funeral service will be held on Tuesday, July 17, at 11:00 A.M. in the Pickering and Son Westborough Funeral Home, 62 West Main St., Westborough. Burial will follow in Pine Grove Cemetery. A calling hours will precede the service from 10 to 11 A.M.